This week we have a chat with the singing, cosplay talents of Ginny Di. Ginny based in Denver, the capital of Colorado, she is not only a cosplayer but she is singer, has great website with great content, youtube channel for her songs and tutorials both cosplay and photography. We talk to her about her cosplay, youtube channel, her singing talents, her love for Critical Role and more. Literally the moment that I knew it existed, I wanted to do it! I’d been enjoying making Halloween costumes and Renaissance Festival costumes for years, but wasn’t familiar with the cosplay scene until some friends took me to a local science fiction convention. That same convention one year later was when I debuted my first cosplay! Sure! 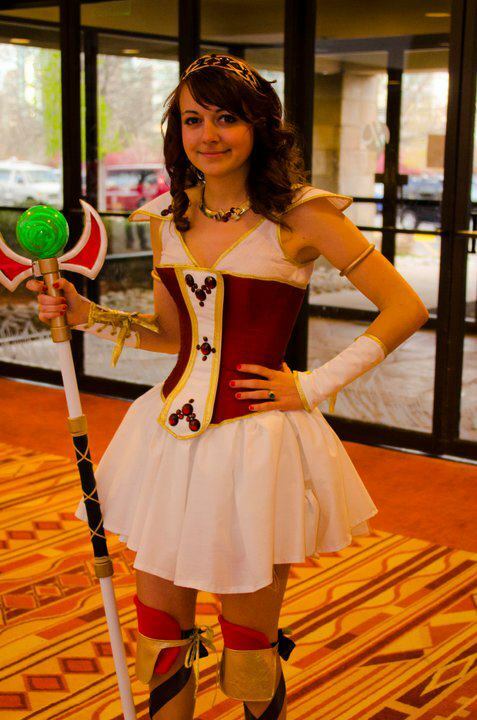 That first cosplay was Codex, Felicia Day’s character from The Guild. I’ve attached a photo of the first time I wore it… super embarrassing, haha! The short version I’ve come up with is “I make costumes from pop culture, and then I wear them!” That normally leads to some more specific questions. But at this point, I don’t have any friends or family members who don’t understand cosplay on at least a basic level! Looking through your past cosplays and you have done a lot. Which has been the most fun to make and wear? Honestly, most of the time my favorite costume is the most recent one I’ve finished, because I’m still excited about it, and proud of my work! Right now, my answer would definitely be Jester from Critical Role. I enjoyed nearly all of the construction process, and then wearing her is a blast because she has such a fun personality and a crazy accent! You have a very entertaining youtube channel. What made you decide to make your channel? Thank you! I made my YouTube channel many, many years ago, when I was just a lame high schooler doing Disney fandubs. I have absolutely no idea what inspired me to start it way back then. It’s just existed for a long time, and gone through a lot of changes over the years! Did you envision how you started you channel would become what it is now? Absolutely not. Honestly, even just a year ago I would’ve been surprised to look into the future and see my channel today. But that’s important on the internet — you have to stay flexible! There are videos of you singing in them. How did that come about? I don’t know, I guess I never thought about it in so many words! I love to sing, I love to cosplay, it made sense to combine them. Recently you did a song about the Ruby of the Sea (Critical Role) which went a bit viral in the critter community and was even discussed on Talks Machina. Where you expecting this sort of reaction? How did you handle it? I was definitely not expecting the kind of response it got! I hoped people would like it, but it got way bigger than I’d ever thought it would. Matt Mercer, the DM, retweeted it, which is sort of the best possible response you can get for a fan creation: When the creator enjoys what you made! I don’t know how I “handled it” per se… it was exciting, it was overwhelming, it was kind of hard to even wrap my head around! You also did a song based off of Taylor swift’s look what you made me do but as Arya Stark. How do you find the Inspiration to make and write these songs? Generally I hear a song and I think “this would be funny if Arya sang it,” and then I make a parody! I’ve been asked before about my “process” and unfortunately I think that’s giving me a little too much credit, haha. Most of my creative work is spontaneous — I have an idea, I get excited about it, so I make something! Music is the same way for me. My primary motivator is the media itself: I love Game of Thrones, so I get inspired to write a Game of Thrones song. I love Critical Role, so I get excited to write a Critical Role song. What advice would you give yourself or others who want to start up a youtube channel? Just do it! You’ll never be “ready,” and nothing prepares you for what it’s going to be like besides just… doing it. You’ll improve as you go, so the sooner you start, the better you’ll get. As for advice I’d give myself… I sometimes need to remind myself that if I’m not having fun, what’s the point of doing this crazy job? I work twice as many hours as I would at a traditional job and I make half as much money, so if I’m not having a fantastic time, I might as well go be an accountant or something. It’s easy to get caught in a rut, or forget that you’re the one in charge. I often have to remind myself to change things up if it isn’t working! Which would you like to be known for most between the cosplayer, musician or youtube host? It would be pretty cool to travel to some location shoots! I’ve been wanting to do some beach/underwater shoots for a long time, since that’s one of the only landscapes that I really don’t have access to in Colorado. I’d also love to do some location shoots at cool historical buildings in Europe, since the States has such a shorter architectural history. Shooting Esmeralda in actual Notre Dame would be a dream come true, although I suspect that might be a little blasphemous… haha! You can follow Ginny Di on the following links.